Centennial Rocks is a fun, family-friendly event designed to bring the NC State Community and Centennial Campus Partners together for beer, food, fun, and live music. This year, we will celebrate the NC State Computer Science Dept.’s 50th Anniversary. This event is powered by the NC State Office of Partnerships and Economic Development in collaboration with the Computer Science Dept., part of NC State’s College of Engineering. 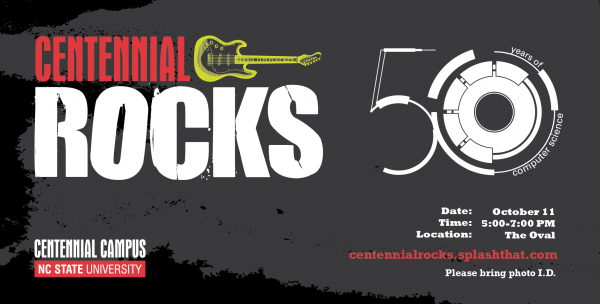 This special Centennial Rocks is proudly sponsored by Eastman Chemical Company, Cisco & Pendo.